Americans, Australians, Germans, Israeli, Canadian, French, British and Indians – Mumbai blasts has left every nation scared with heinous act of urban warfare. In memory of all those who has lost their lives. …but terrorist dared to stay on and fight with security forces for 3 days. One terrorist has been captured alive and is revealing chilling details of how they actually planned to blow up Taj Mahal Hotel and take lives of 5000 people. 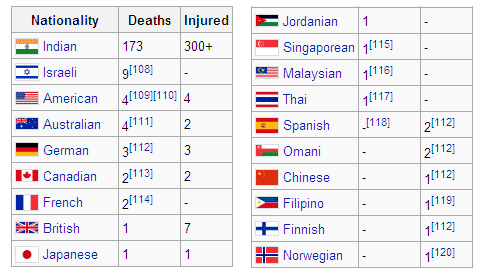 Above image via Wikipedia, get more info on Mumbai Blasts in our earlier post. Appreciate the post, spirit of Indians and Mumbaikars in particular will never go down!